Salem United Methodist Church - September 23, 2018: Won’t You Be My PEACEFUL Neighbor? 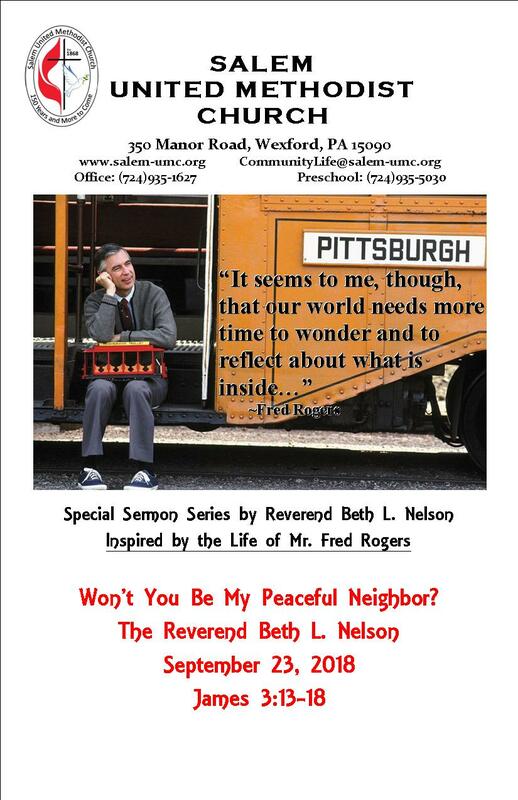 Home/Words from Pastor Beth L. Nelson/September 23, 2018: Won’t You Be My PEACEFUL Neighbor? There are millions in our world today in search of inner peace. The internet and bookstores are full of the most recent insight or wisdom on the issue. And many of those who buy books are the very ones that are too busy to read books. There are retreat centers and college classes on inner peace. Today there are mediation rooms in airports and finding inner peace is a multi-million-dollar industry. And Christians are not the only people of faith seeking peace. The Bible has a lot to say about peace. The prophet Isaiah foretold the coming of Jesus and called him the Prince of peace. The apostle Paul refers to God “the God of all peace.” The term peace is often used in greetings and benedictions, our hellos and our goodbyes. So how do we have inner peace? The word peace is often translated in the Bible to actually mean, “to tie together as a whole, or when all essential parts are joined together.” Inner peace then, is a wholeness of mind and spirit, our whole heart in calmness. Inner peace is not dependent on external surroundings in the world. Inner peace does not depend on where we are or who we are with. Jesus said, “Peace I leave with you, my peace I give to you. I do not give as the world gives. Let not your hearts be troubled and do not be afraid.” Jesus also tells his followers that there will be difficult days and the world will be full of trouble. Jesus says that he has overcome the world. Jesus, by his example… tells us that peace is not the absence of trouble. It is the presence of God. Inner peace comes when we see God as the sovereign one, the almighty one, source of our power. Peace comes when we exercise our faith in who God is and the power God offers. We can have peace even in the midst of trouble when we remember that, “All things work together for good for those that love God according to his purposes.” Inner peace comes from an authentic relationship with God. We are commanded to live in peace as far as it is up to us. It means that we are to interact with those around us in accordance to our own wholeness of mind, body and soul. And Jesus says, “Blessed are the peacemakers for they shall be called the children of God.” God’s desire is that we who know God’s power and wrath are the ones to learn to first live in peace with themselves. We are called to bring that peace in to all circumstances. Our world needs more people to bring a sense of calmness and wisdom. Our world needs more peace makers! And Mr. Rogers was one such man. And he did it not do it from a pulpit or diplomatic position. He did it through children’s programming on TV. Mr. Rogers’ Neighborhood went national in 1968 (during the Vietnam War). Mr. Rogers developed shows that were anti-war. Not long after Martin Luther King, Jr. was assassinated, cities erupted in riots across the nation. Mr. Rogers understood the problems of growing divisions between whites and African Americans. And that is why he introduce an African American police officer in the neighborhood. Mr. Rogers was also very much in tune with the emerging feminist movement of the early 1970s. Long before Sally Ride ever became the first woman astronaut in the United States, Fred Rogers had his most colorful puppet, Lady Elaine Fairchilde, flying to Pluto and discovering another planet along the way. Mr. Rogers embodied peace in all his shows! settle down. He’d say, we need to quiet the inner turbulence. It is no accident that the opening shot of every show begins with a flashing yellow light…caution. The message at the beginning of every show….slow down. When he would remove his suit jacket and put on a sweater…a ritual that was slow and created what Life magazine called “a way of lulling you.” In a world that was fast… Mr. Rogers came in slow and surprisingly it worked. And it created an atmosphere of slowness and it brought the children together. The children loved it! I believe that is one of this gifts that he gives to children and adults. When Mayor Maggie tried to sing the song, Peace and Quiet too fast… everyone knew that something was wrong. When Daniel Striped Tiger felt inadequate because he could not say his ABCs really fast, Mr. Rogers pointed out that it was not important to be in a hurry all the time. One night, Mr. Rogers was on the Tonight show with Johnny Carson. Johnny was trying to get Mr. Roger fired up but soon discovered… his slow pace was not an act. Spend time in silence thinking about the people who have helped you through out your life. Now gearing this to children who have live 6 or 8 years… but gearing this to some of us…. And the silence produces a longer list. Silence leads to reflection and reflection leads to appreciation. And I will add that when we are very appreciative, we tend to be more content and peaceful. Mr. Rogers used the moments of silence to be thankful for people who have helped you in your life at several award shows. When graciously accepting praise, he turned it into a shared moment of reflection and gratitude. It had an amazing effect on the gathered people. personally appreciated his for his friendship and the remembrance of who Henri always talked of God’s still small voice speaking today. It is in silence that we best hear God speaking. Is it possible to slow down in our 24/7 world? Is it practical to even imagine silence in our lives? The world may say it doesn’t work, but this week the same world celebrated the 50th anniversary of Mr. Rogers’ Neighborhood. We all want peace. We all want peace.